Many forex traders are familiar with the concepts of volume price analysis as enshrined in Wyckoff’s three laws of effort and result, cause and effect and supply and demand. This is the linear relationship between volume and price. Now with the Volume Point of Control, this relationship is taken to the next level adding the concept of time, and inspired by the ideas behind market profile. The Quantum Volume Point of Control, or VPOC indicator blends ALL THREE of these important aspects of trading into a single powerful and visual indicator. First, the Quantum VPOC indicator constructs the Volume Profile from a set number of bars in history to the most current bar. The Volume Profile is then presented as a vertical histogram shown at the right edge of the chart – a stack of horizontal bars of varying lengths, but of equal height representing the amount of activity at each price level. Second, the Quantum VPOC analyzes the Volume Profile to find the key price levels where activity is strong and rising, or weak and falling. In other words, the indicator looks for peaks (long bars) of the Volume Profile where price tends to be attracted as these are areas where price was previously accepted. These are called High Volume Nodes (HVN). The indicator also looks for troughs or valleys (short bars) of the Volume Profile where price tends to be repelled as these are areas where price was previously rejected. These are referred to as Low Volume Nodes (LVN). Both types of price level act as precise zones of support and resistance and as such are projected across the chart within the given period. Third, the Quantum VPOC indicator looks for the Highest Volume Node or the highest peak in the Volume Profile and marks it as the Volume Point of Control – the price level which acts as the fulcrum from which price pivots. The indicator completes its calculations and updates as each new volume bar is delivered. The result is a chart revealing the overarching influence of volume at price, coupled with time. 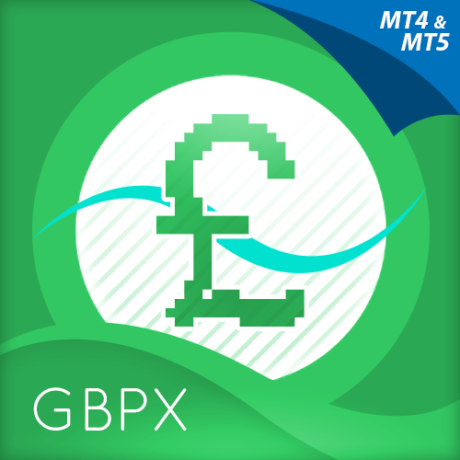 Volume Profile – this appears as a histogram of volume on the vertical price axis on the right hand side of the chart. The peaks and troughs are clearly displayed highlighting both High and Low Volume nodes. High volume node (HVN) – this is where we have a bulge in the volume profile generally as a result of an extended phase of price congestion. As a result, as the market approaches these regions on the chart price action is likely to become waterlogged with further congestion likely with the node acting as a strong area of support or resistance. As we have seen a strong acceptance of price at this level in the past, this is likely to be repeated with the market swinging in a range. Ultimately the market may reverse off these levels, with any move through then confirming the current sentiment. Low volume node (LVN) – this is where we see low volume in the volume profile. In these regions, the market has only paused temporarily – in other words a region where price has been rejected in the past. As such we are likely to see the market move quickly through these regions with little in the way of resistance or support acting to prevent a further advance of decline in price. The current sentiment is likely to continue and build quickly through these levels. Support and Resistance Zones – these are drawn at the High and Low Volume nodes to highlight the various HVN and LVN levels on the price axis. Volume Point of Control Line – this is drawn as a single line on the highest volume of the High Volume Node in the timeframe and clearly defines the tipping point of sentiment. This moves dynamically and represents the fulcrum of market sentiment where price has reached agreement, before moving on. If it is above the price action, then the current market sentiment is bearish. If it is below the current price action, then the current market sentiment is bullish. The VPOC Line reveals this balance simply, quickly and clearly allowing you to judge market sentiment with accuracy and confidence. As with all the Quantum Trading indicators, the VPOC indicator is dynamic, constantly changing and updating to reflect the relentless shift in sentiment as the market moves from bullish to bearish and back again. The indicator works in all timeframes and provides a powerful and much deeper understanding of support and resistance through the prism of volume and the associated High and Low Volume Nodes, with the Point of Control itself, acting as the fulcrum of the market. 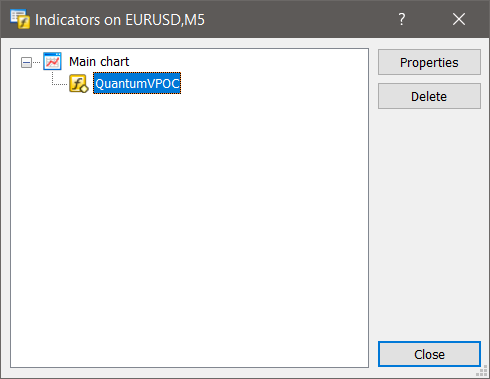 To start using the indicator, you can click and drag QuantumVPOC from the Navigator to a chart or you can also double-click QuantumVPOC (which will then be applied to the currently selected chart). Doing either one of these will display the Custom Indicator window where you can configure all the various user settings for your Quantum VPOC. These options are grouped and can be accessed by selecting the tabs which will be discussed further in the following sections. Once you are done customizing the indicator’s options, click OK to run the indicator. Here you will find all the basic information about the indicator such as its name, description, and version number. You can configure the indicator by changing its variables listed in this tab. These are explained in further detail below and for each configurable input of the Quantum VPOC. The Quantum VPOC uses drawing objects instead of plot lines so this tab is empty. 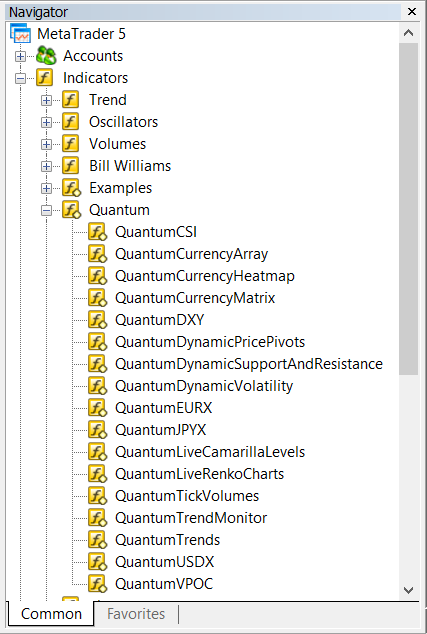 Let’s go back to the Inputs tab and explain how to customize the settings of your Quantum VPOC indicator. 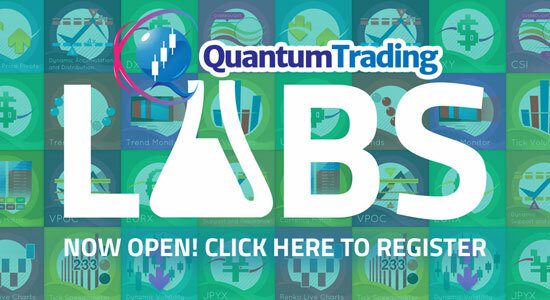 When running the Quantum VPOC for the first time in your trading account, you need to enter the email you used to register in the Quantum Trading Indicators Enablement System – http://enable.quantumtrading.com/ as part of its verification process. You only need to do this once as the email is stored in the terminal’s global variable cache after it is entered initially. Please make sure that you enter your email correctly and exactly without any extra spaces before and after it. If you made an error, simply fill this field again to update it. This setting determines the scope of the indicator. The objects generated by the indicator such as the support and resistance zones, volume point of control, and the volume profile will cover bars up to the set value of the period parameter. For example, the Look Back is set to the default value which is 140 bars. The indicator will calculate the volume profile from the 140th bar in the chart to the most current one. The support and resistance zones as well as the volume point of control will only be projected to the 140th bar in history. The volume profile the indicator generates is composed of several horizontal bars stacked on top of each other of varying lengths. 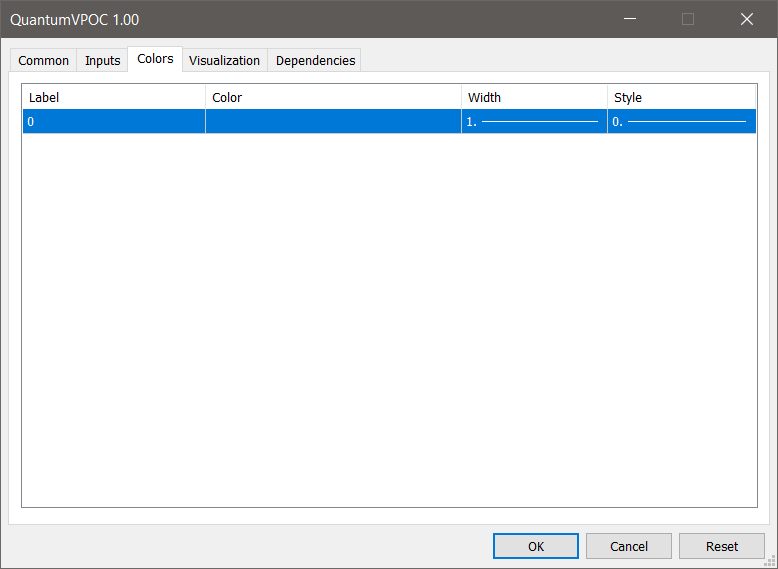 The Volume profile bar count parameter allows you to refine the definition of the volume profile by increasing or decreasing the profile’s number of bars. Increasing its value will make each bar of the volume profile narrower but increase in number. The support and resistance zones also become narrower, but retain its number. Inversely, decreasing its value will make each bar of the volume profile thicker, but decrease in number. The support and resistance zones become narrower, but retain its number. Its default value is 50 bars. Real Volume – this applies to markets with centralised exchanges only. 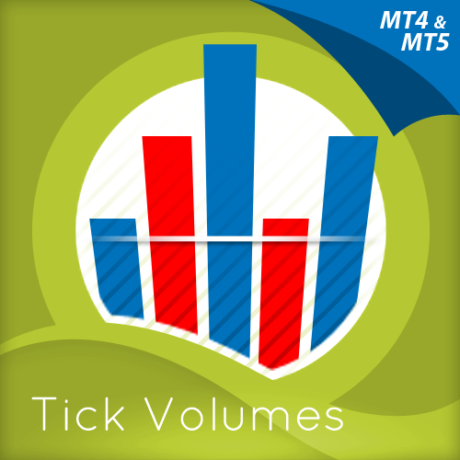 For spot forex and derivates, you use tick volume which represents a proxy for volume in the form of activity. However for other markets such as stocks, some brokers offer real volume for those markets which have a centralised exchange. As you can see, all possible numbers of support and resistance zones are even. This is because zones come in pairs, that is, the first kind of zone projects High Volume Nodes (HVN) and the other projects Low Volume Nodes (LVN). To change the value of this parameter, simply select any one of these predefined numbers from the dropdown menu. Its default value is EIGHT (8) support and resistance zones. You can toggle this parameter to either true or false to display or hide the volume profile. Its default value is true. 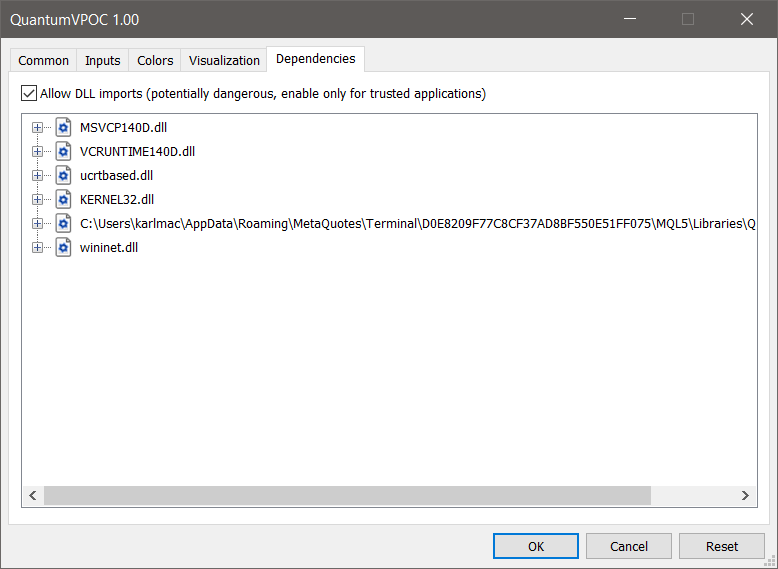 You can toggle this parameter to either true or false to display or hide the volume point of control. Its default value is true. You can toggle this parameter to either true or false to display or hide the support and resistance zones. Its default value is true. The Volume profile offset field shifts the position of the Volume Profile to the right. 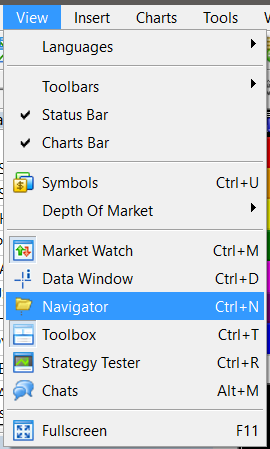 Before you change the value of this input, please make sure that Shift end of the chart from right border is toggled on (this is found in the toolbar). Its default value is 0 but if you change its value to, say 10, it will move the Volume Profile 10 bars to the right. This is especially useful when you want to keep clear of the space where the new bar forms. The Display volume profile from left field can be set to either true or false. Setting it to true will switch the position of the Volume Profile from right to left. This is another way to minimize clutter in the rightmost area of the chart. It is also useful for when you find the Volume Profile truncated due to gaps (during weekends or holidays) especially at the start of the week. The volume profile is divided into two by the volume point of control. This parameter sets the color of the top half of the volume profile. Its default value is navy. The volume profile is divided into two by the volume point of control. This parameter sets the color of the bottom half of the volume profile. Its default is indigo. Support and resistance levels can be either High Volume Nodes (HVN) or Low Volume Nodes (LVN). 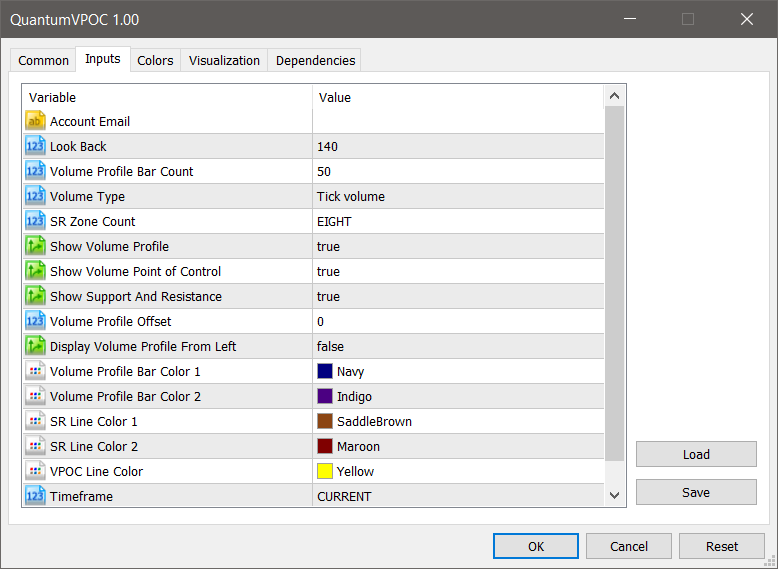 This parameter sets the color of support and resistance levels that are projected from HVN. Its default value is saddlebrown. Support and resistance levels can be either High Volume Nodes (HVN) or Low Volume Nodes (LVN). This parameter sets the color of the support and resistance levels that are projected from LVN. Its default value is maroon. 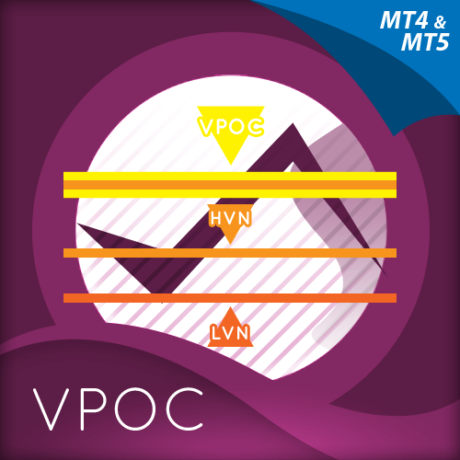 This parameter sets the color of the volume point of control (VPOC). Its default value is yellow. 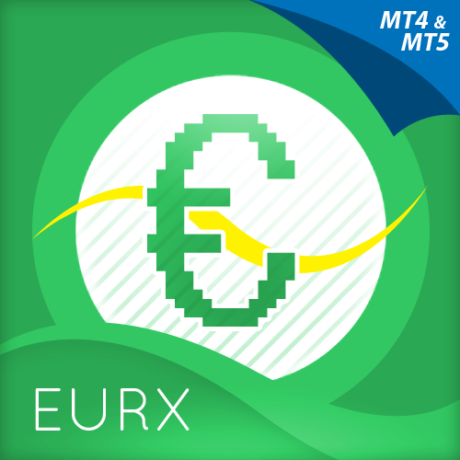 NEXT_TIMEFRAME sets the source timeframe to the next standard MT4 timeframe. 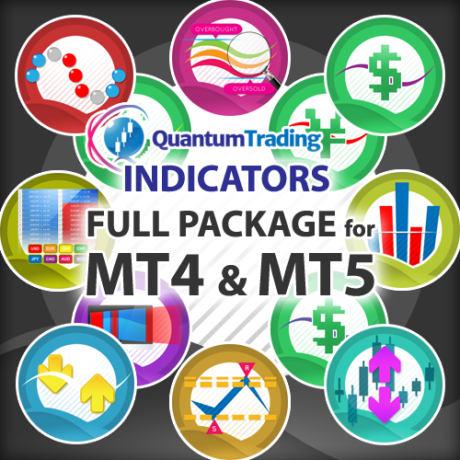 For example – if the indicator is attached to a M1 chart, the indicator will get its data from M5. Likewise, if the indicator is attached to a H1 chart, the indicator will get its data from H4. However if the indicator is attached to a MN chart, the indicator will still get its data from MN as there is no standard timeframe after it. CURRENT_TIMEFRAME is the default setting of this parameter. The indicator uses the chart’s timeframe as source when set to this value. MINUTE_1 sets the source timeframe to M1. MINUTE_5 sets the source timeframe to M5. MINUTE_15 sets the source timeframe to M15. MINUTE_30 sets the source timeframe to M30. HOUR_1 sets the source timeframe to H1. HOUR_4 sets the source timeframe to H4. WEEK_1 sets the source timeframe to W1. MONTH_1 sets the source timeframe to MN. Please note that setting a value lower than the chart’s current timeframe causes the output to appear smaller than normal as shown below. Imagine placing a small jar inside a larger jar. The small jar fits in with lots of space to spare. Setting a value higher than the chart’s current timeframe causes the output to appear bigger than normal as shown below. Again, imagine trying to put a large jar in a smaller jar. It will not fit and only a portion of the large jar is covered by the smaller jar’s mouth. 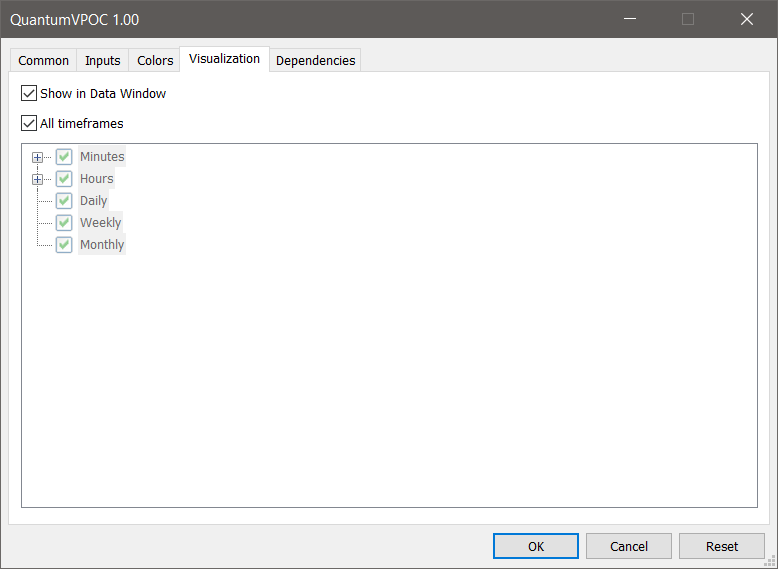 Naturally you would want to set the Timeframe parameter to a value higher than the current chart’s timeframe for a proper multi-timeframe analysis. Select QuantumVPOC and click the Delete button then click the Close button.